I have heard it said that one must have an intuitive knowledge of what makes an art form tick to satirize it effectively. That certainly applies to the writer-illustrator team responsible for the dystopian drama in which superheroes question their roles and attack the human residents of a large city. 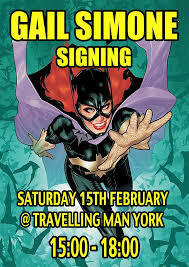 She’s one of the rock stars of the comic book biz. And you only have to click on the link below to understand what a talented and versatile artist Jim Calafiore is. 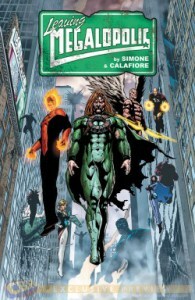 As LEAVING MEGALOPOLIS proves, Mr. Calafiore takes Ms. Simone’s subversive text and brings it to raucous, rockin’ life. epic in scope and yet meticulous in detail. There is a phrase a film critic once used to describe director David Lean’s style that, I think, describes Mr. C’s style in this graphic novel. And that phrase is “intimate epic”. Those cool features at the back of the book are like a graphic novel equivalent of DVD extras. A 14 page bonus feature, “Wonderboy”, starts out with two superheroes arguing about who is going to rescue yet another hapless human (“This is my block. I save her!”) before things turn irrevocably dark.